ALASKA: Gov Drops Reelection Bid, Endorses Democrat - Joe.My.God. Alaska Gov. Bill Walker announced Friday he is dropping his bid for re-election, and threw support to Democrat Mark Begich over Republican Mike Dunleavy. 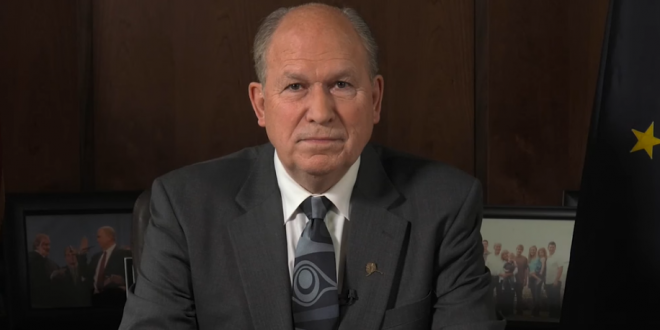 Walker, elected as an independent, made the surprise announcement at the Alaska Federation of Natives annual convention, three days after former Lt. Gov. Byron Mallott abruptly stepped down from both his office and the re-election campaign over unspecified “inappropriate comments” he made to a woman. With less than three weeks until Election Day and with more than 23,000 absentee ballots already mailed to voters, Walker’s decision to step away from his campaign marks a significant, last-minute change in the battle to become Alaska’s next governor. National Democrats celebrated Walker’s decision. In a statement, Elisabeth Pearson, the executive director of the Democratic Governors Association, called it a “game-changer” that puts Begich “in a strong position” to win next month’s election.